Unfortunately, I have not been that motivated to bake as of late. It has been nearly a week since the last time I pulled something warm and fragrant from my oven. I am not really sure what was keeping me away from the kitchen, but whatever it was has definitely passed. I was browsing the internet this morning before leaving for church when I came across a recipe for Carrot and Squash Curry Soup from The Pioneer Woman that looked delicious. My mom and I decided that we would cook up a big batch of this for dinner and serve it alongside baked potatoes and Brussels Sprouts with Bacon and Apples. I was stuck on what we would serve for dessert. Of course we would be having ice cream (my family cannot get enough ice cream), but what would accompany the ice cream? What would end this hearty fall meal on the right note? Then it hit me. Gingersnaps. 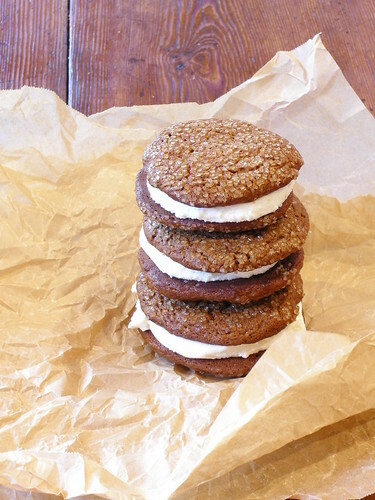 The spiciness of the gingersnaps would mirror the spiciness of the soup but reinvent it into a sweet, crispy cookie. 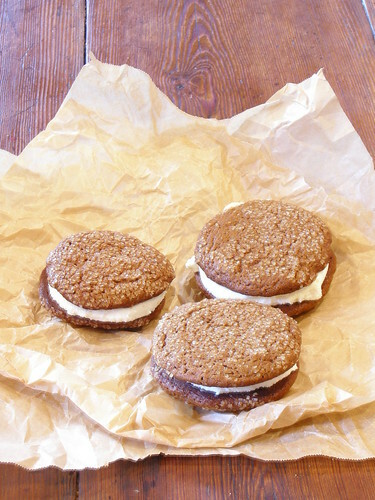 We could even use the cookies to make ice cream sandwiches! I figured that Room for Dessert would have a recipe, and luckily I was right. As these cookies are meant to chill in logs, they are perfect for storing in the freezer to have at the ready for a last minute party or guest. The cookies sparkled from the sugar and smelled heavenly. They were crunchy but still moist and tender; they were delicious. To make my ice cream sandwiches, I froze a few cookies in order to help the sandwiches stay together better. I scooped ice cream onto one cookie and layered the second on top, pressing down lightly. I used Ciao Bella's Key Lime Graham, but any number of flavors would be delicious. Cream butter and sugar. Stir in molasses and vanilla. Beat in eggs one at a time. Whisk together flour, baking soda, salt, and spices. Mix dry ingredients into creamed butter mixture until thoroughly incorporated. Fold in candied ginger. Divide dough in four. On a lightly floured surface, roll each portion into a log about 8 inches long and 1 1/2 inches in diameter. Wrap logs in plastic and refrigerate until firm enough to slice. Preheat oven to 350. Line two baking sheets with parchment paper. Cut chilled dough into 1/2-inch thick slices. Dip one side of each slice in coarse sugar and place on baking sheets. Bake for 10 minutes, rotating halfway through.